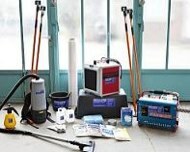 Mould in buildings is one of the most common environmental problems inside rooms. It is caused by the increased moisture content in building materials or on their surface after damage caused by water and quickly become a nuisance and problem, for example, on account of inadequate thermal standards. We can offer professional, state-of-the-art remediation that guarantees a preservation of the basic structure of the building and fast re-use of the residential or business rooms. Many of our employees have been trained by an independent technical standards organization on the topic of indoor mould and will be pleased to be of assistance. Our professional mould remediation program includes Hepa filter air cleaners, the corresponding appropriate anti-mould preparations, special mould suction apparatus with Hepa filter and fogging devices. The fogging method is suitable to effectively and economically combat indoor mould. The Lucke fogger distributes the active components, that are free from harmful substances, so finely in the air that the suspended mist not only neutralises odour particles in the air and porous materials, it also kills allergens and spores.